Cystic fibrosis (CF) is the most common fatal genetic disease affecting Canadian children and young adults. There is currently no cure. CF has various effects on the body, but mainly on the digestive system and lungs. The range and severity of symptoms differ from person to person. However, most patients suffer from a build-up of mucus in the lungs making it very difficult to breathe. This build-up also causes persistent and ongoing lung infections which eventually destroys them and their function, causing death in the majority of people with the disease. Typical complications caused by cystic fibrosis include: difficulty in digesting fats and proteins, vitamin deficiencies due to loss of pancreatic enzymes, and progressive loss of lung function. It is estimated that one in every 3,600 children born in Canada has cystic fibrosis. Almost 4,100 Canadian children, adolescents, and adults with cystic fibrosis attend specialized CF clinics. For more information about disease management, please visit Living with Cystic Fibrosis on the Cystic Fibrosis Canada website. The therapy is performed using the device shown here. The main components of the PEP device consist of a one way valve connected to a small-exit orifice. A manometer is incorporated to measure the expiratory pressure. 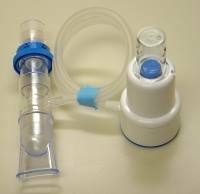 Low pressure PEP devices typically generate a pressure range of 10–20 cm H2O at mid-expiration. Sit upright and comfortably while holding the mask firmly over the nose and mouth. Breathe in a normal sized breath volume through the PEP mask. Then breathe out actively against the PEP mask, to create a back pressure of between 10-20 cm of water, as measured by the manometer. Repeat for 15 breaths, breathing at a normal respiratory rate. The breath out through the PEP mask should take 3-4 seconds. Take the PEP mask off and do 3 “huffs”. Cough and spit out any of the mucus. Take a break for 1-2 minutes and focus on relaxed abdominal breathing. Repeat these steps 6 times, PEP mask therapy should take at least 20 minutes. The children with CF have to do this therapy twice a day and it is very boring and repetitive. Presently, the only way for parents to assure children are doing the therapy properly is to sit with them for the whole therapy session. This is very time consuming and as the child gets older, can be quite invasive to the child. Physiotherapists have no way of monitoring overall compliance to PEP mask therapy except for parental reporting. This means studies as to the effectiveness of the therapy may not be as accurate as possible. What is Did We Create? 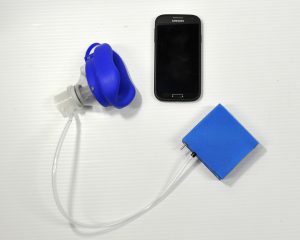 Measures the breathing volume, times breaths and pauses, and wirelessly sends that information to a mobile device. Links a game on a mobile device directly to the real-time results of the PEP therapy. The game provides instant feedback and reward if the child does well. Provides an audio response to the therapy so that a parent or caregiver can hear that the therapy is being conducted correctly at a short distance. Records all therapy sessions. This includes the success of each session (reaching 10-20cm for 3-4 seconds, 1-2 minute break x 6) and keep a historical record of therapy sessions and success. For more technical information about the project, look here. The Bella Project aims to create games using the air input created during PEP therapy as an input for games. But why make them? Let’s make therapy fun. PEP therapy is generally done at home, and in the case of children, with parental supervision. It’s repetitive and boring, and patients often begin to neglect it – but it’s ultimately a very key aspect of managing cystic fibrosis. Why not help make this necessary part of life fun?